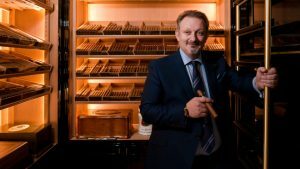 As the director of food and beverage at The Wellesley Hotel in London, award-winning cigar sommelier Giuseppe Ruo oversees one of the finest spirit and cigar collections in the world. We recently asked Ruo his best advice for cigar newbies looking to become aficionados. When you were growing up in Apulia, Italy, did the older men in the village smoke cigars? In my village, I used to observe the older men smoking a typical Italian cigar called Toscano. It struck me how sophisticated they looked and how passionate they were about their cigars—they gave off a sense of prestige.